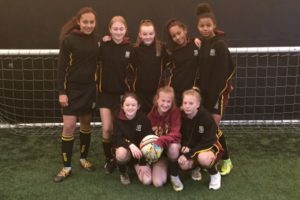 Last Thursday, the year 8 girls’ Football team competed in a 6 a side tournament organised by Preston North End. There were 19 teams there in total and the standard was very high. The girls won against Moor Park 4 – 0 and Albany 2 – 0. However, they then lost 2- 0 to a strong Broughton side who went on to win the competition. They fought hard against Holy Cross, unfortunately conceding a late goal making the score 2-1. This resulted in them finishing third in their group to go through to the plate in the knockout stage. They beat Broughton’s second team after going to penalties, thanks to some great saves from Olivia Gregson together with equally fantastic strikes from Ellie Sumner and Alicia Scott. Unfortunately they went on to lose 2-1 to Priory. Overall, a great result and a very enjoyable competition.